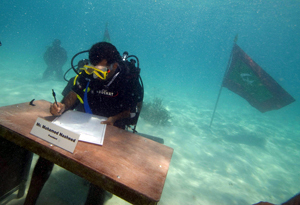 The government of the Maldives held a very strange meeting last week – the President, the Vice-President, and the Cabinet ministers all put on their diving outfits and held a meeting about 20 feet (6 meters) under water. They used hand signals and wrote on a whiteboard with water-proof markers, and passed a declaration asking all countries to help reduce global warming. This is an issue that affects everyone on Earth, but the Maldives has even more reason to be worried! The Maldives is a tiny country of more than a thousand islands in the Indian Ocean. It is estimated by some scientists that the temperature increase on Earth will cause the sea levels to rise by around 2 feet (60 cm) within a hundred years. The problem for the Maldives is that most of the country is less than 3 feet (1 meter) above sea level, so there is a good chance that the country could be completely under water in the future! It’s a very serious concern for the country and about a year ago, the President of Maldives, Mohamed Nasheed, said that he was going to start putting money aside for buying land to relocate his people. The Earth has gotten warmer over the last 130 years by about 1.4 degrees Fahrenheit (0.8 degrees Celsius). This could be something that the Earth is naturally doing, but many scientists believe that the Earth has gotten warmer because of an increase in greenhouse gases created by some of our activities. Carbon dioxide and a few other gases such as methane, ozone, and nitrous oxide are called greenhouse gases because they help create something called “the greenhouse effect”. This is what keeps the Earth warm – without these gases, our planet would have been much colder. But human activity has now driven up the production of these greenhouse gases. For example, when our car runs on petrol, it is producing carbon dioxide. When our computer runs at home, it needs electricity, which we get from a power plant. Many of the power plants burn fossil fuels, and that in turn produces more carbon dioxide. The larger amount of greenhouse gases is making our planet warmer than its usual state, causing global warming. Amongst other things, the warmer Earth can cause increased melting of its glaciers causing our sea levels to rise. Many countries around the globe are trying to find ways of decreasing their greenhouse gas emissions – some countries have enforced the use of low-energy light bulbs, and some have started using alternate methods of producing energy such as the sun, wind, and tides. The Maldives is trying to remind us that we all need to do a lot more!